President Obama signed “The Monsanto Protection Act." 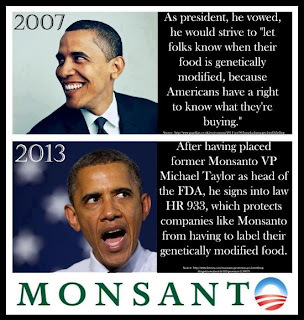 “The Monsanto Protection Act.” It details a restriction of governmental intervention to halt the supply and production of genetically modified seeds and crops, even if studies conclude that they pose an environmental danger. Why dont we know about it? It is so important ? Why should we care that it was not highly publicized? Was is intentionally "covered up'" as many other unpopular decisions ? My mind is spinning, as I am sure many of the other green activitists. What about the general public? or it just us again, "The Paranoid green consumers. who over react to anything" and ready to "Occupy ...anything!"? Lets investigate, if any of it should be a concern or the facts below are isolated incident and not a pattern. 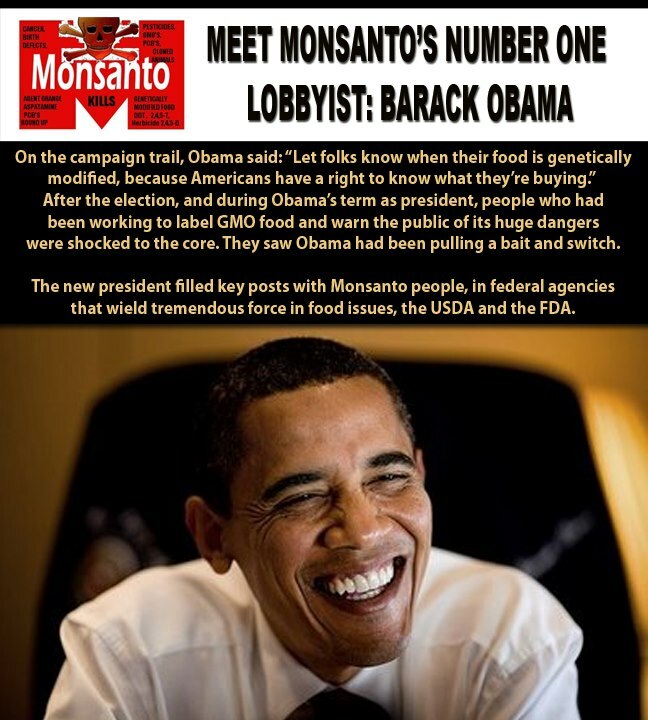 Grossing over $2 billion last year, Monsanto is one of the largest agricultural biotechnology corporations on the planet. Its contributions to our world include a wide array of pesticides, genetically modified soya and corn seeds and LEDs. Oh, and Agent Orange, the chemical used by the U.S. army to kill hundreds of thousands of Vietnamese during the ’60s. A mixed bag to be sure. It may be the case that Monsanto has moved on from its enthusiasm for murder, joining the nouveau movement many, ironically, describe as “responsible capitalism.” But it is still far from being the altruistic provider its website portrays it to be, with an Argentinian scholarship here, a smiling African child there. 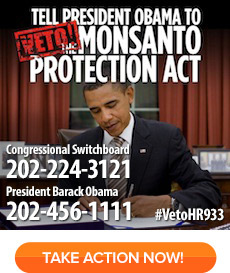 Last year alone, Monsanto took more than 100 American family farmers to court for infringement of patent laws, and in 2012 they spent $46 million on advertising efforts to dissuade Californian residents from voting “yes” on a piece of legislation that would force producers to openly label their GM products. In short, one of the largest food production corporations in the world has made it obvious that they would rather the public did not know what is going into their food. The provisions Obama signed into law last Thursday directly infringe upon states’ right to protect its people and ecosystem if the worst-case scenario becomes a reality. 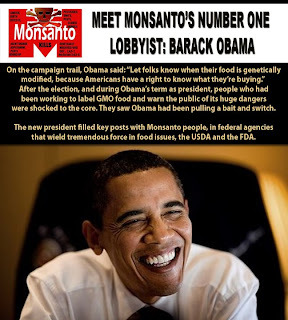 Yet, by the looks of things, Monsanto was the only third party to collude in the bill’s creation and, according to the Russian Times, contributed $64,250 to the 2012 election campaign of the bill’s author, Sen. Roy Blunt, R-Mo. Perhaps it is not all that surprising to hear of a multinational corporation lobbying Washington to see its needs are met. Perhaps it is not all too strange to hear Blunt, once voted the “most crooked member of Congress,” took a little financial convincing. ...and one more thing I am wondering about: What kind of food does Mr.Obama family eat? I have heard there is an organic garden in the White House that his wife is so proud about. Does that mean they are trying to avoid GMO in their food? Why? What is safe for a general public might not be that safe for his own children? Strange. Oh, well, I might be just having a bad day..
Sign up for Exclusive Green Deals & Coupons? Know of an Eco Business that should be in Green Directory?